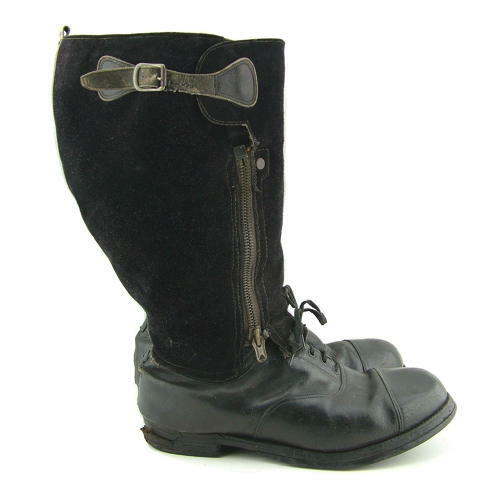 The wartime 'escape' pattern flying boot. Approximately size 7 or 8. The suede uppers are in good condition with only light rubbing and soiling. Some wear to the straps/buckles - one has torn and been stitched back together. Both 'Swift' branded zips are period replacements and work well. The shoe sections are sound but somewhat scuffed and the back of the right foot has been squashed somewhat. It would appear that the same shoe has been partially restitched to the uppers at some stage. Both soles have been replaced and the heels show considerable wear, the right heel being virtually worn away. The fur linings are a bit grubby but in decent overall condition. Original insoles absent. Not the smartest pair but they do display quite well and the heels could be replaced by a good cobbler if desired. Stock code B22672.